As the US Federal Reserve lays the verbal groundwork for an eventual real-world quantitative easing (QE) taper, bond prices are dropping at an accelerated rate. In order to understand the ramifications of a Federal Reserve taper on the prices of a bond or bond portfolio, what is needed is a bond convexity primer. In the parlance of those who know calculus, convexity is the second derivative. For the layperson this is known as the rate of change in change. For convexity to make better sense, let me compare it to driving a car. When you are driving a car your speed is the rate of change in the car’s location. Want to change your speed (i.e., the rate of change)? Then you either give the car more gas with the accelerator or press down on the brakes to slow the car down. Speeding up and slowing down are the second derivative. Speeding up means that there is a positive second derivative, while slowing down means that there is a negative second derivative. Related to the bond market, the speed of your car is called duration, while the speeding up/slowing down is known as convexity. The higher the convexity, the more dramatic the change in price given a move in interest rates. Whatever you call it, after a while, if you keep braking a car it stops. After a while, if your bond is experiencing negative convexity, it also slows down/loses value. The harder the acceleration or braking, the greater the change in your speed. So why is the relationship between a bond’s yield and its price known as convexity? As yields change, the change in the price of the bond is not linear; it is curved in a convex fashion. To understand convexity more directly take a look at the following three graphs, all for a $1,000 par value bond, with a coupon rate of 3.452%, making payments twice per year, and with zero expectation of a yield change in the future. The only thing making these three bonds different is the number of years until maturity — 30 years, 10 years, and 1 year. Above is the bond with a 30-year maturity. Look at how curved — i.e., how convex — the graph of the price-yield relationship is! Notice also that there are no capital gains/changes in price at the exact yield of the bond, 3.45%, where the line actually touches the horizontal axis. This means that if yields stay the same as the coupon rate there should be no change in the price of the bond. A 10-year maturity bond is graphed above. Look at how much less convex the line is relating price to yield. Again, note that the line touches the horizontal axis at 3.45%. Maturity: Positive correlation; the longer the maturity the greater the convexity/price sensitivity to yield changes. Coupon: Negative correlation; the higher the coupon the lower the convexity/price sensitivity to yield changes. Yield: Negative correlation; the lower the yield the higher the convexity/price sensitivity to yield changes. To best understand this, look at the graph above for the 30-year bond. The lower the yield goes the higher the convexity/price sensitivity as compared with the higher yield portion of the curve. I have kept things simple here. If the bond has embedded options, such as calls or puts, it will affect some of the above relationships, sometimes dramatically. Because every bond has a unique structure and issuer, it is impossible to dole out advice on the exact relationships. But because call and put options generally affect maturity you can make informed guesses as to the affect on convexity. Another factor often not discussed in the price performance of bonds and bond portfolios is how rapidly changes in interest rates occur. The further into the future and the smaller the interest rate changes, the less damage done to a bond or portfolio today. So, in an environment of central bank tapering, investors want low convexity bonds and bond portfolios. Such a portfolio, as rare as a golden goose, would have a short maturity, high coupon rate, and a high yield. Good luck finding that! Thank you for this primer. I wonder if you would be so kind as to send me the spreadsheet directly. Again, thank you. I have just sent you a copy of the spreadsheet directly. I am happy that you liked the primer. Great article. It beats any CSU class I’ve taken, at articulating a concept through laymen terms. Yet, it’s practical and full of content. I am looking forward to reading more of your work. So glad that you enjoyed it (!) and thanks for reaching out to let me know. Also, my colleagues and I are dedicated to providing useful information to investors from the perspective of former pro investors. So check back here often for more (I think) great content. This is a very interesting, simplified and yet comprehensive write-up. Credits to you Mr. Voss. Please if you don’t mind, kindly forward the spreedsheet results to my e-mail. Thank you. Thank you for the praise, much appreciated. Our online editor has made the links for downloading the spreadsheet more obvious now. Please click on the “•Bonds: How Capital Gains Change With Interest Rate Changes, GP” at the end of the post to download the most relevant spreadsheet. Thank you for your article, but I wonder why investors want low convexity bonds. Investors want low convexity bonds right now because they are least sensitive to a change in yields. Right now bond prices are falling/yields are rising so folks want bonds that are less responsive to these changes. Also, while it may look like capital losses are lower with a 30-year bond, take a look at the scale on the left-hand/vertical axis and you will see that it starts at -$5,000, as opposed to -$500 for the 10 year maturity bond, and $50 for the 1 year bond. What this means is that the capital loss on the 30-year bond if interest rates go up just 1.0% is 16.31%. Download the spreadsheet and play with the assumptions in cells B12 and B13 to see the changes. Investors want low convexity bonds right now because they are least sensitive to a change in yields. What you should have said is investors want low “negative convexity” bonds right now. And what does a bond with low “negative convexity” have? High POSITIVE convexity. When interest rates move, you always want higher convexity over lower convexity (assuming the same duration.) This is well-known among fixed income investors. You are correct that what I wanted to convey is that investors want low negative convexity right now. In fact, toward the end of the post this is what I say. You are incorrect that I don’t understand the difference. Jason, the spreadsheet you attached is a great teaching tool and the format is easy to follow. Thanks for posting! Thank you very much, I am glad that you liked it and that you found the spreadsheet to be easy to follow. Woohoo! Thank you for this wonderful article. This is gonna help greatly in my preparation for CFA Level 1 exams. I’m so pleased to read that you think this piece is wonderful and happy that you think it will help you with the Level I exam. Good news on all fronts. With yields turning negative, do you think convexity will remain positive for vanilla bonds? Thanks for your question. In all honesty, I have no strong opinion about it. Excellent article for the lay person and very timely. Sorry I’m late to the party but I don’t think it’s accurate to say that you necessarily want low convexity in a tapering (or rising yield) environment. It depends what side of the convexity curve your bond resides. For any given duration, you would want HIGH convexity if you are on the right hand (the flattening) part of the curve. The higher the convexity, the more the right side of the curve will be flattening. And the more the curve is flattening, the less the price will decline as yields rise. 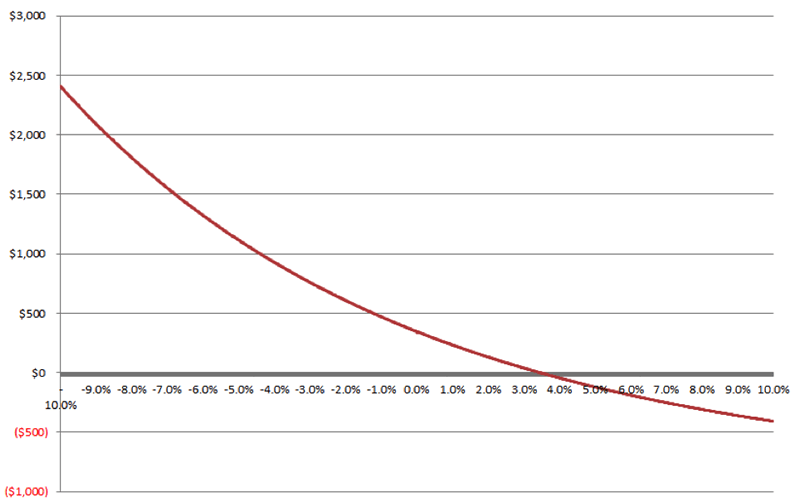 Bonds on the right side of the curve yield more than the coupon . In other words, in a tapering environment, lower coupon bonds (lower than the current yield) will outperform higher coupon bonds of similar duration. Thank you for your added level of detail to the discussion. Much appreciated. Can u please understand how lower coupon bonds out perform in a tapering environment? Would it be possible to get the unprotected version of the spreadsheet “Bonds- how capital gains change with interest rate changes”? For what purpose would you be using the unprotected version of the spreadsheet? I wanted to model multiple bonds, strictly educational. Thank you for your interest. I am going to decline sharing the unprotected version of the spreadsheet. If you use Excel’s PV function you should be able to replicate the spreadsheet and for your interest of modeling multiple bonds. Bond trading strategies,their explanations, their limitations, their contingencies, and their applications could fill up many pages, so my comments here have to be limited. Also, I am not sure what you already know, so I have to guess a bit. For starters, “roll down” is a strategy that works as long as the yield curve is upward sloping, meaning that bonds of longer maturity yield more than bonds of shorter maturity. Another important consideration is that the yield curve does not shift upward while trying to take advantage of the “roll down.” Put another way, the strategy is reliant on yields staying roughly the same, why? As yields rise it makes bonds with lower yields and similiar maturities and credit qualities less attractive. After all, why would I buy a 30 year maturity bond yielding 4% issued by a AAA credit, when I could buy a 30 year maturity bond just issued and yielding the current market rate of 5% for a AAA credit? Very few would purchase the 4% bond, so its price must fall. 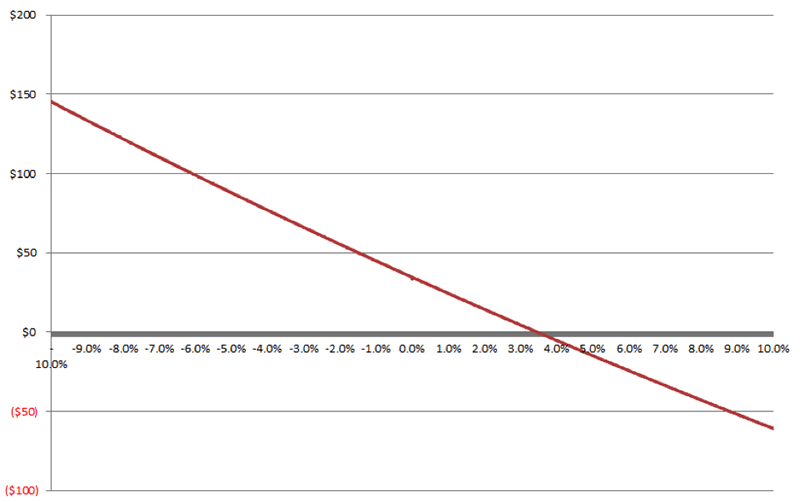 And it is the falling price that offsets the benefit of the “roll down” strategy. So, assuming an upward sloping, stable yield curve, what is the “roll down” strategy? For me it is helpful to think of bonds with maturities of longer than one year as multiple bonds. Say, for example, I own a 2 year maturity bond yielding 1% that pays interest once a year, this is essentially the same as owning a 1 year maturity bond paying 1% one year from today, another one year bond that won’t pay me my 1% interest until the end of two years, and a zero coupon bond that will not pay me my principal amount until the end of year two. When you see bonds of greater than one year maturity in this way then you can compare long-term bonds to short-term bonds to see which one is likely to have a higher expected return given your assumptions for what the yield curve does. I could buy bond a and be paid my $5 in interest at the end of year one, as well as receive my principal of $1,000 back. Or I could buy bond b and sell it at the end of year one and earn $15 in interest at the end of year one and receive my principal back here, too, and likely the principal amount would likely be a bit higher (see below). So that 3 year bond could have been viewed as a 1 year bond by me if I think of bonds as a stream of interest payments and one principal repayment at maturity. So options a and b could be seen as two competing 1 year bonds if I wanted to think of them in that way. By buying b I have triple the return, plus a likely slightly higher principal amount received from the sale, less my trading costs for selling the bond. Obviously, I have taken on greater risk due to the duration and convexity risks in buying the second bond, but if you are confident of the shape of the yield curve this may be a more profitable strategy. There are two opposing forces at work here. As time passes, a longer term bond becomes a shorter term bond. As a bond advances in age it tends to rise in value because its risk of not suriving to maturity decreases. Working in opposition to this, however, is the force pushing down against the value of the bond: as it advances in age it will pay less total interest so the bond’s yield to maturity approaches 0% at the moment just before maturity. Why is this the case? In the 3 year example above there are 4 payments owed to the buyer of the bond when issued: 1) year 1 interest; 2) year 2 interest; 3) year 3 interest; and 4) principal repayment. At the end of year 2 any owner of the bond only receives two additional payments: year 3 interest and principal. This tends to lower the value of the bond. So the “roll down” term comes because I can buy a longer-term bond and roll with it down the yield curve. I buy a 3 year bond, and sell it at the end of year 1 when it is now a 2 year bond. I found your explanation of roll down here to be very interesting. I have a follow up question that I’ve been struggling with. Suppose I bought a 10yr bond at par on an upward sloping yield curve. In one year, I want to sell that bond. Thus it would now be a 9yr and I could reap the benefits of roll-down in this situation. However, if the yield curve has shifted up during this period, what is the true impact of the roll return? The roll helps to offset some of the capital loss, how do I know exactly what impact roll has made? Would it be the difference between the 10yr and 9yr bond on the original curve, or the difference between the 10yr and 9yr bond on the T+1 curve? The total return impact would be the difference between the 10yr price on the original curve and the 9yr price on the T+1 curve, but I’m struggling with how I’d know just how much of that was driven by roll. So in essence one would want to own floating rate securities, high yields, or low duration bonds, right? It all depends on your forecast for interest rates and the shape of the future yield curve. I am also a slow learner and so am doubly pleased that you found the blog post beneficial! move in rates. Would this be attributed to the rapidity of the move, and as such, should these securities regain their alleged defensive nature in a more gradual rising rate environment? Thank your interest in the post and for the question. I must leave the answer to your question to the audience as we generally steer away from commenting on market or security movements at CFA Institute. Instead, we prefer to discuss tools that hopefully allow you to assess these things trenchantly. Feel free to share your own views, too! Thanks for the amazing explanation. I have one question related to convexity if you can please clarify. The general convention is that bond with higher convexity are better because their prices rises more when yields fall and decreases at a slower rate when yield rise compared to a bond with lower convexity. Can you please let me know the underlying logic for the same. The logic is this. Convexity can also be thought of as the propensity for the DURATION of a bond to change when INTEREST RATES change. So, when interest rates go down, you would wish to have longer duration bonds (because they’ll experience more price appreciation.) A bond with high positive convexity will indeed tend to increase in duration when interest rates decrease. So that’s better for you. A bond with negative convexity will DECREASE in duration as interest rates go down — exactly the opposite of what you want. Therefore you get a worse price return. What’s really happening here is that the expected cash flows of the negatively convex bond change as interest rates go down (either through principal prepayment or calls.) That’s why the duration decreases. On the other side of the coin, negatively convex bonds INCREASE in duration when yields go up. So that’s bad compared to positively convex bonds. The graph showing the relationship between the price of a bond and its yield duration with respect to changes in interest rates is non-linear, therefore it is curved. 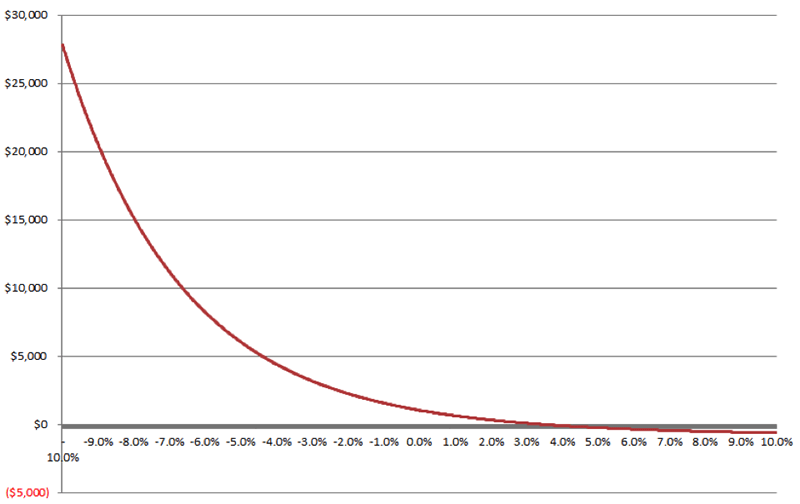 The reasons that lead to the curve are discussed in the article: maturity, coupon, and yield. Duration, a sibling to convexity, is basically the time weighted average of when you get paid back by owning a bond. Because most bonds pay back principal only at the very end of the bond term, it causes a skewing of duration toward the end of the term. In turn, this skewing causes the curve to bend. As alluded to immediately above, time causes bending, too. That is because of the time value of money. A rupee received today is much more valuable than one received in the future. The further into the future the payback of the rupee, the lower its value to you today in a normal world of positive interest rates. This makes sense, right? After all, if I borrow a rupee from you today and promise to pay it back in 1,000 years, my promise to pay it back has very little value to you. As the maturity is pushed further into the future this causes a non-linear effect on bond pricing today. Put another way, the 999th year of interest is not really that different to you than the 1,000th year of interest. That’s because as you go further in time the value between interest payments diminishes. Compare that 1,000 year bond to getting paid back in two years. In this case, there is a big difference between this year and next year in percentage terms. Two years from today is 100% longer away from you than next year. Consequently, there is a bigger, more linear effect on duration with short maturities. The next thing to understand is the spread between the stated coupon rate of a bond and the current interest rate. The wider this spread, the more non-linear the effect on price of the bond. If you have access to a desktop computer, download the spreadsheets associated with this post, and play around with the assumptions so that you can see the effect of changes on convexity. For those looking for a simply strategy that will deliver some alpha with the “inevitable” rate increases coming, go buy a NOB spread i.e. notes (10yr) over bonds (30yr). As the yield curve begins (continues) to steepen, everything explained above in this great article can be taken advantage of. Be sure to look up “current” DV01 for each futures contract so you can apply the appropriate notionally weighted hedge ratio. Apologies, I forgot to include the link to the CME group where you can find current (real-time….delayed by I think 20mins) DV01 for treasury futures products. P.S. Trading the NOB spread is a “boring” trade; you will not get any “quick” kicks from it because it’s not subjected to the wild swings as when trading the outright, but you will be satisfied (as long as your timing and discipline is right). Duration and convexity are two metrics used to help investors understand how the price of a bond will be affected by changes in interest rates. How a bond’s price responds to changes in interest rates is measured by its duration, and can help investors understand the implications for a bond’s price should interest rates change. The change in a bond’s duration for a given change in yields can be measured by its convexity.